Made in Australia, Oceania, 1907. 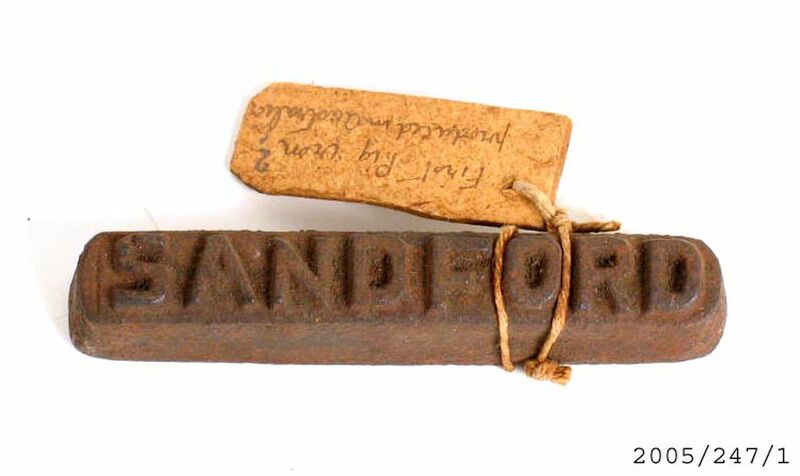 Rectangular ingot with embossed name of maker 'Sandford'. Paper label attached with inscription ' First Pig Iron Produced in Australia'. This ingot was produced by William Sandford in his Lithgow blast furnace presumably as part of the official opening ceremonies on 13 May 1907. William Sandford had arrived in Australia in 1883 to manage a wire-netting plant for John Lysaght. Three years later he took over the lease of the Fitzroy Ironworks in Mittagong and later the Lithgow ironworks. Not content with simply precessing steel from imported or re-used iron, he decided to set up a blast furnace. After much research and with a seven-year government contract for the supply of pig iron, Sandford built a blast furnace on 22 hectares of land in Lithgow. On 13 May 1907, the premier of NSW declared the plant officially open at a ceremony where guests were brought up from Sydney by train.